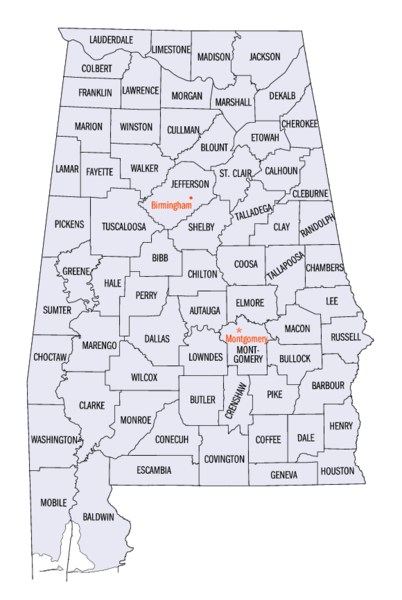 In addition to our collection of historical maps, we have created maps of some Alabama counties and several special purpose maps. Please remember that our maps normally contain only locations we have personally visited or researched for some reason or other. With this said, you will find points of interest overlooked or ignored by other mapmakers. Route of Streight’s Raid through Northern Alabama, which started at Nashville and was eventually headed for Rome, GA. Streight’s Raid included the Battle of Day’s Gap. Straight-lines simply connect the places in chronological order and should not be considered anywhere near accurate route paths. The Battle of Day’s Gap, fought on April 30, 1863, was the first in a series of American Civil War skirmishes in Cullman County, Alabama, that lasted until May 2, known as Streight’s Raid. Commanding the Union forces was Col. Abel Streight; Brig. Gen. Nathan Bedford Forrest led the Confederate forces. Scale 1:380,160. LC Civil War Maps (2nd ed. ), 102.8 General map of southern Alabama and West Florida showing roads, railroads, towns, drainage, and a few names of residents along the Tensaw River. Description derived from published bibliography. Map is incomplete; the bottom border is missing. Available also through the Library of Congress web site as raster image. Contributor: Hains, Peter C. (Peter Conover) – Holtz, Helmuth – Hains, Peter C.
Scale 1:14,400. LC Civil War Maps (2nd ed. ), 104 Union positions are colored blue, and Confederate works are red. Includes roads, vegetation, drainage, and relief by hachures. Description derived from published bibliography.